Maguss Wand: IRL Wizard Dueling Game | Nerd Much? If you’re like us, you’ve been obsessed with casting spells, flying dragons and leveling up mages for quite some time. Most of that is either on a game board or video game, though, right? Now, a cool new concept has hit Kickstarter in the form of an IRL (in real life for those keeping score at home) wizard dueling game, complete with a wand, “real” spells, and open world gameplay. The project is called the Maguss Wand, and it’s a pretty exciting prototype that has so much potential that we’re already practicing our wand spells. Basically, the Maguss Wand presents a chance for everyone to experience a fantasy game in our everyday surroundings. In fact, your dueling arenas are wherever you’d like them to be. How does it work? There are three game modes, each with varying complexity and possibilities. You’ll be able to duel with a friend face-to-face, or find an opponent online (although, we haven’t seen how online play will work just yet). Players use their Maguss Wand to cast spells and defeat their opponents. Spells are cast by performing the correct motion for the specific spell while aiming at the opponent. 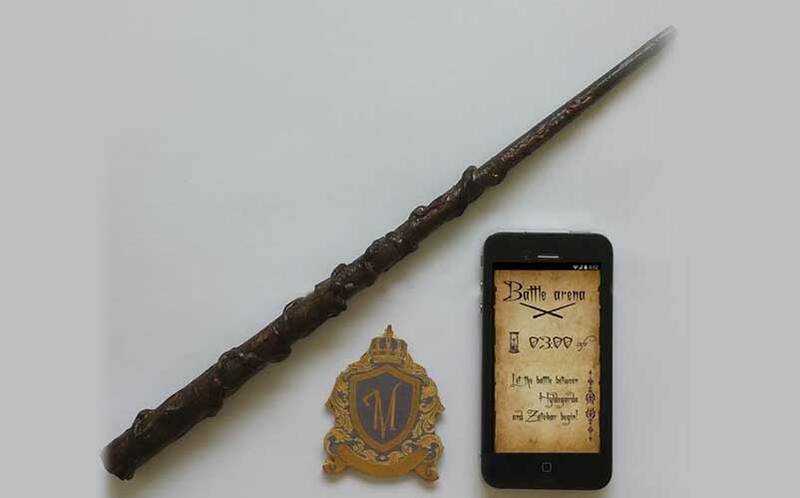 The wand transmits an infrared signal that is mirrored by a receiver that is worn by every wizard (shaped like a coat of arms), with details sent to a companion smartphone app. The smartphone will display which spells were cast on both sides and what they caused. Each spell has its own energy/mana cost, so wizards won’t be able to just spam the most powerful spell in their book to win. And, each spell does varying amounts of damage to opposing players. According to the Maguss Wand Kickstarter page, the wand is made of either wood or plastic, and wizards will have the ability to personalize their wands. The Maguss Wand application will play specific sound effects when players are hit with spells, with each spell having its own unique sound. That’s not all, though. You’re started off with a few basic spells, and then you have to level up to earn more spells. And, there are specific factions in the game which allow players to use even more unique spells. What’s more, wizards will be able to have their own unique character name which no one else can claim in the world. Seriously, cool. Naturally, in order for players to level up, they’ll need to earn experience points, which are earned by practicing, dueling or completing quests. You know, because it wouldn’t be an RPG-inspired game without quests. The Maguss Wand is quite an ambitious project, and is an interesting twist on what appears to be a way more advanced and nerd-skinned version of laser tag. So, count us in, and we hope to be able to play it soon enough it. It looks like the standard package (which includes a wand, the app, and a receiver) will retail for $66USD, although you’d obviously need at least two of them (one for you, and one for your opponent). So, you know, start polishing up on your Harry Potter spells. Back this project on Kickstarter. See More Cool Stuff Here.